Complete your look with this simple yet classic bracelet. This bracelet features sixteen colourful oval shaped light doublet opal in claw set sourced from quality opal mines in Coober Pedy, South Australia. The bracelet is hand crafted to a standard of perfection in 14k white gold to create a beautiful jewellery item. 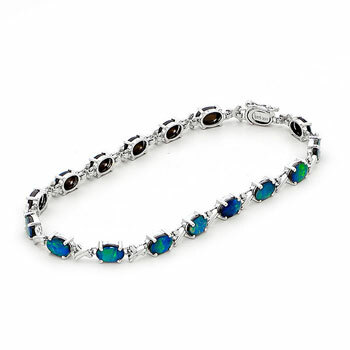 The color of the opal in this bracelet makes it a precious and elegant opal heirloom collection.